Taking proper care of your health in general, including your eye health, should be your number one priority no matter how old you are, so do your best to take it seriously. Here’s a list of four great ways to take better care of your eyes, so check them out and do something good for yourself today! A large number of people from all across the globe tend to skip their annual eye checks for a lot of different reasons. Sadly, this is true for people who experience particular symptoms on a daily basis, too. If you’re one of those people, make sure to see an eye care professional right away – even if the symptoms are temporary. Some of the most common ones are red eye and pain in the eye, as well as partial or total vision loss in one or both eyes. The same goes for having trouble seeing objects on the sides of your visual field and for having difficulty reading or seeing at night. You should definitely see an eye care professional if the objects you see are less sharp or if you have trouble telling the difference between colors. An injury to the eye or the bone surrounding the eye is also a good enough reason to see your eye doctor, so book an appointment if you’re experiencing any of these at the moment and solve your problem before it transforms into a more complex one! As already mentioned, booking an appointment with an eye care professional is absolutely essential once you start to experience particular symptoms. This is crucial because only an experienced professional can identify serious vision problems such as glaucoma or diabetic retinopathy at an early stage. 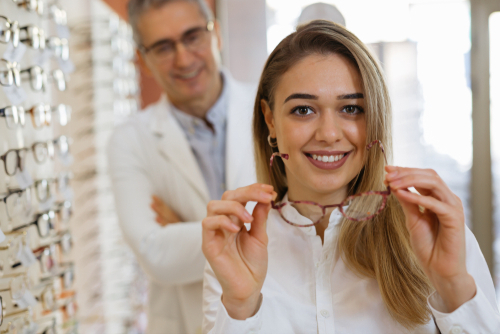 So, if you have a change in vision or any other eye problem, but you don’t really know which kind of eye care professional to see, here are four main categories you should bear in mind. Opticians belong to the first group and they distribute glasses but don’t diagnose eye problems. There are also optometrists who do eye exams, diagnose eye diseases, and prescribe glasses, contact lenses and eye medicines to treat diseases. On the other hand, ophthalmologists diagnose and treat diseases that affect the eyes. They do surgery, too. Last but not least, there are primary care providers who get involved when an eye problem is a part of a general health problem. In case you weren’t aware of it, the fact is that computer monitors, TVs, and room lighting can affect your eyes in more ways than you can possibly imagine – especially if they aren’t positioned properly. For example, computer monitors should be positioned about an arm’s length away from the eyes and 20 degrees below eye level. This will keep your eyes from getting strained. Of course, if you have trouble looking at the monitor for a long time and your vision starts to blur, you should definitely get a pair of glasses that will give you crystal-clear vision and keep your eyes healthy. So, if you live in Australia and you’re desperately in need of a brand new pair of glasses, be sure to visit your optometrist who can help you sort out your problems with vision. As for the room lighting, you need to make sure that there is enough light which is diffused at the same time. Lights that are focused and too bright may put too much stress on your eyes, so bear that in mind and do whatever it takes to protect them. No matter what you do, your eyes need to be properly protected, so try not to forget that if you want to keep your eye health at a high level. This is particularly true when it comes to home improvement projects – even the simplest ones, as these can potentially end up quite bad for your eyes. Yes, we know that hanging a picture frame seems really simple and straightforward, but you know what? There are a lot of things that can go wrong, so don’t try your luck and wear safety glasses instead. A lot of people didn’t wear those when a piece of the nail or frame broke off and ended up in their eye! The fact is that safety goggles can prevent about 90 percent of job-related injuries, so don’t skip them at any cost and you’ll see what we’re talking about. The same goes for any other DIY project at home, as well as for gardening activities and sports like swimming, where your eyes are exposed to chlorine. Just keep it safe and you won’t regret it! As you can tell, there are a lot of great ways to take better care of your eyes, and these four are certainly the best ones out there. All you need to do is to stick to our tips and guidelines and you’ll keep your eyes as healthy as possible, without a shadow of a doubt!